This week there is a set of Resurrection Task Cards with ideas on how to use them. Also, a Resurrection Mini Book in color and black & white. That is just the printables for this lesson! Last week we studied Jesus and the trials that He went through. We also looked at some of the things that happened to Jesus while He was on the cross. Today, we are going to talk about what happened after Jesus died. These facts are found in Matthew 27:57-28:15; Mark 15:42-16:13; Luke 23:50-24:48; John 19:38-20:31. Nicodemus also helped Joseph. He brought about 100 pounds of myrrh and aloes. (John 19:39) They wrapped Jesus in strips of linen with the spices, and laid Jesus in a new tomb. The tomb was in the garden where Jesus had been crucified and was cut out of rock. (John 19:41) A stone was rolled in front of the opening. Mary and Mary Magdalene watched to see where Jesus was buried. The angel told the women to hurry, go tell the Disciples that Jesus is alive and that He will meet them in Galilee. They were afraid, but amazed and went to tell the Disciples what the angel said. Next week we will study Jesus meeting with His Disciples and Jesus returning to Heaven. I love review task cards! I like to review past lessons so the students can understand the whole picture. I would print one set for the class (unless you have a large class and need to divide the kids) and either put them in a container and let them draw out the cards to answer, or hand them out. There are two questions per task card and these are only in color. They can also be used to put the events in order. The students can also put them in order and use the pictures to tell you the facts. Click here to download. 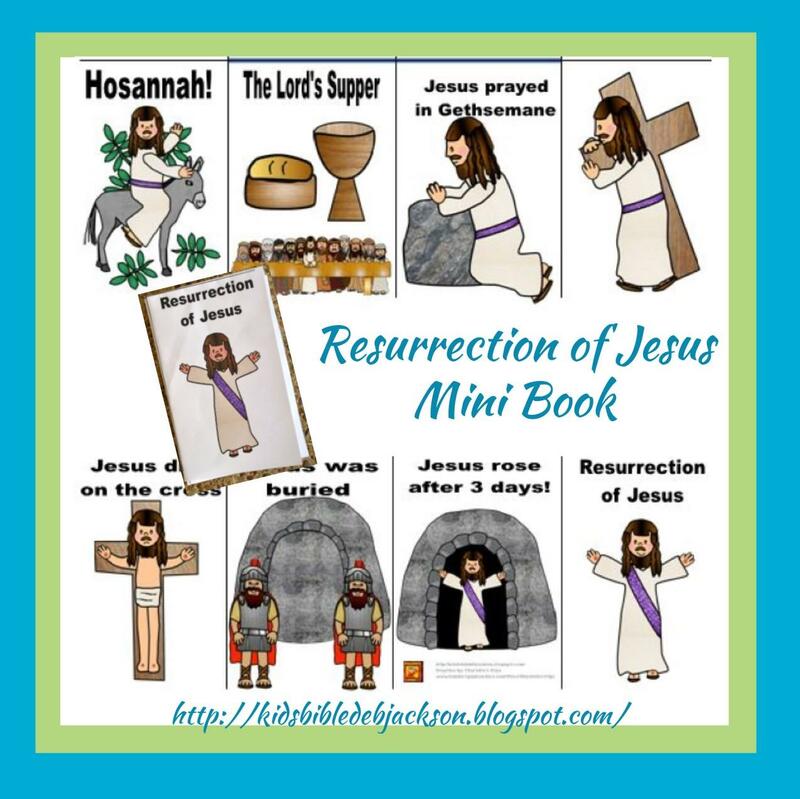 This simple mini book about the resurrection is available in color and black & white. Kids love these little books! Click here to download. Click on the above worksheet to print. Today's Bible Verse: He is not here; for He is risen, as He said. Come, see the place where the Lord lay. Matthew 28:6 (NKJV) Click on the picture to print the NKJV Bible Verse & Teacher's Visual. Visiting from Grace & Truth today. This post brought a smile to my face and joy to my heart as I imagined eager little faces soaking in the truth of Jesus' resurrection. Hallelujah! Thank you for sharing. I really like your visuals. One of my favorite lessons to teach! Thank you for sharing this lesson, free printables, etc! God Bless you!